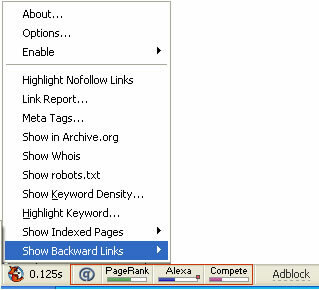 Smart Toobar is a Firefox add-on which enables you to check Google page rank and alexa rank of a website. This toolbar is not an official product of Alexa, it is a product Smart Pagerank. See the Alexa Rank of every page you visit. See the Google PageRank of every page you visit. Estimate the value of the website that you are currently viewing. See the PageRank of the backlinks to the current page. See the whois for the page that you are currently viewing. Check if other tld’s for the domain is available for the page that you are currently viewing. Check the Google PageRank from multiple data centers for the page that you are currently viewing. Search Status is another Firefox extension to check your alexa rank. Currently i am using this plugin and it works well. I prefer Search Status over Smart Toolbar because it just fits in my status bar and it doesn’t occupy my browser space. Already i have few toolbars installed and my browser area is shrinking more and more. Search Status has most of the features Smart Toolbar has and in addition it shows Compete Rank as well. I actually use SearchStatus because it supposedly has the same effect as the Alexa Toolbar. I too prefer SearchStatus for Alexa and PR status of any blog. great collection of addons. i use search status which saves me alot of time.